When it’s time to improve your home, it’s important to notice everything in your home carefully. Nowadays with modern technology, we can update our life. 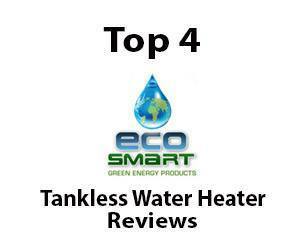 Tankless Water Heating technology is one of the best water heating technology which can save your home space and money. So if you are thinking to buy a tankless water heater you and want to more about it then you are in the right place. EcoSmart tankless water heaters can save you money on your water heating bills by regulating the amount of energy it takes to heat up your water, plus the tankless design saves plenty of space in your home. There are several models to consider while making the change to electrical tankless water heating system, especially when you are considering incoming water temperatures and general water usage within your own home. With the ability to provide up to about 12 cubic feet of storage space within your home, and with a guarantee of never running out of hot water, this EcoSmarttankless water heater is a definite product to consider while improving your home. This model is great for those larger households as it is the largest and most efficient electric tankless water heater available with the EcoSmart patented technology. Designed for very low temperature: This electric tankless water heater is configured for climates where the incoming water temperature is capable of dropping as low as 37F. The Ecosmart ECCO 27 is able to heat nearly 3 GPM at this temperature. 3 GPM: By heating nearly 3 gallons per minute to an ideal temperature, even within colder conditions where the incoming water is at a low 37 degrees Fahrenheit, this EcoSmarttankless water heater is incredibly quick and adaptable for bigger families. No more arguing over who has used the last of the hot water, as this heater can easily handle two showers going on at the same time. Self-modulating technology: This is also the largest tankless electric water heater that is available with a Self-Modulating Technology. The models are well-suited for homes that have large Jacuzzi or Roman-style tubs and that generally have more demand for water. Cons: you will have to find the right size on your own for your water needs and other requirements. This EcoSmart is an economical addition to families with larger hot water needs, and for those who like their water hot, just so! Ideal for a small apartment, there are numerous features that make this heater a great option for not only home improvement but bills improvement too! 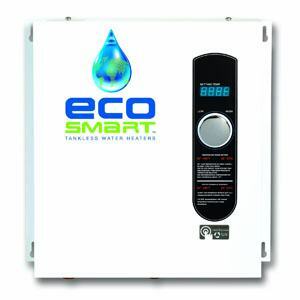 The EcoSmart ECO 11 can save you up to 60% off of your water heating costs with its self-modulating technology. Self-modulating technology: The self-modulating technology stops the wasting of energy when heating gallons of water to a specific temperature, as requested by the digital temperature control, by not overheating the water in any way and only using the energy that is needed. Energy efficiency: when it comes to saving energy costs, EcoSmart ECO 11 sets the benchmark for other heaters. It can operate using 11Kw at 220 compared to 13kw at 240. This saves a lot of electricity. Compact design: unlike conventional tank type water heaters, EcoSmart ECO 11 is designed such a way that it saves up to 12 cubic feet of storage space. Designed for low temperature: It is equipped with the digital temperature controls feature which offers one-degree increment. It also gives the users full control over the hot water’s temperatures. This is said to be perfect for the whole family especially for areas where temperatures are as low as 67 degrees F.
Point of Use application: It can also heat up to 2 gallons per minute and at times you can run the sink and shower with 1.5 gallons per minute flow at 105 degrees F output setting. Thus, you can use it as the Point of Use application for the sink in cold climatic conditions. Cons: this heater is reported to be not effective in very cold climates where the temperature is very low. With a capability of heating over 2.5 gallons per minute, this model can run two showers simultaneously – a great treat for busy adults or quarreling children! With a lifetime warranty – as the same as all EcoSmart water heaters – this tankless water heater will constantly provide hot water in a residential property. Ideal incoming water temperatures for the ECO 18 are 62 degrees Fahrenheit and above, with 70 degrees Fahrenheit being ideal for the running of two simultaneous showers. 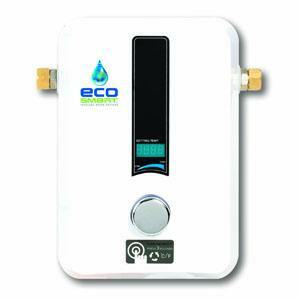 Self-modulating technology: EcoSmart ECO-18 Electric Tankless Water Heater uses patented self-modulating technology. This allows the heater to regulate how much energy is required to heat the needed amount of water. Thus, this heater saves up to 60% on your water heating bills. Lifetime warranty: one of the most amazing features of this heater is that it comes with a lifetime warranty. This warranty covers electronics such as heater, exchanger, and element. Digital temperature control: another unique feature of this unit is its digital temperature control. With this, you can control and set the temperature anywhere from 80 to 140 degree Fahrenheit. Therefore, no matter what the climate is, you can get your desired hot water. Compact and sleek design: this amazing heater is one of the lightest water heaters you will come across. It weighs only 14 pounds. The heater is made of copper and stainless components which makes it an efficient as well as the nice looking water heater. Cons: the price of this heater is a bit higher compared to other Ecosmart heaters. But that should not be a problem since the heater is worth every penny. 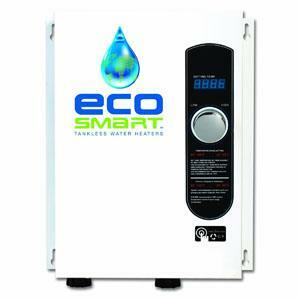 The EcoSmart ECO-18 Electric Tankless Water Heater is a great match for a larger apartment or townhouse for smaller households. As a mid-range model of the EcoSmarttankless water heaters, the ECO 18 is compact, portable and easy to install! As a different type of water heater, the EcoSmart ECO MINI saves you water by eliminating the wait for hot water to reach the faucet. By installing the heater directly at the sink, the ECO MINI is connected to the water line, minimizing the time to wait for hot water to come through when you are trying to wash dishes. Point of Use applications: one of the great features of this water heater is its point of use application. Therefore, no water supplied gets wasted. Pressure Relief Valve: another great feature of this unit is that the ECO MINI comes with a pressure relief valve. This valve is used when the pressure of water becomes too high. This allows the heater to run efficiently and prevents damage to it. Easy installation: EcoSmart ECO MINI includes an appliance line cord. Therefore, it is very easy to install this tankless water heater. Cons: the warranty for this unit is not up to the mark. Other than that, it is a great product. As a real time saver and water saver, the ECO MINI will save on your water bills. If you desire to be more ambitious with your home improvement, you can add more volume, simply by installing a tankless heater such as the ones described above. The EcoSmart ECO MINI is ideal for double sink vanity units or for an outdoor cooking area – it’s a great water saver for instant hot water. If you are thinking of purchasing any of these water heaters after reading the above EcoSmart tankless water heater reviews, I will encourage you to compare and contrast each product’s individual features and what it can do for your home. Each product varies in size and capability depending on incoming water temperature, so do your homework before making the switch to the tankless water heating system. However, judging by the technology EcoSmart offers, it is obvious why the brand has had many positive reviews online. The benefits of both less water wastage and less dependency on oil and gas supplies make these heaters environment-friendly. If you need help picking the best tankless water heater, please feel free to contact us and we will get back to you soon!